Jane Hamilton, award-winning author of The Book of Ruth and A Map of the World, is back in top form with a richly textured novel about a tragic accident and its effects on two generations of a family. When Aaron Maciver’s beautiful young wife, Madeline, suffers brain damage in a bike accident, she is left with the intellectual powers of a six-year-old. In the years that follow, Aaron and his second wife care for Madeline with deep tenderness and devotion as they raise two children of their own. Narrated by Aaron’s son, Mac, When Madeline Was Young chronicles the Maciver family through the decades, from Mac’s childhood growing up with Madeline and his cousin Buddy in Wisconsin through the Vietnam War, through Mac’s years as a husband with children of his own, and through Buddy’s involvement with the subsequent Gulf Wars. Jane Hamilton, with her usual humor and keen observations of human relationships, deftly explores the Maciver’s unusual situation and examines notions of childhood (through Mac and Buddy’s actual youth as well as Madeline’s infantilization) and a rivalry between Buddy’s and Mac’s families that spans decades and various wars. She captures the pleasures and frustrations of marriage and family, and she exposes the role that past relationships, rivalries, and regrets inevitably play in the lives of adults. Inspired in part by Elizabeth Spencer’s Light in the Piazza, Hamilton offers an honest and exquisite portrait of how a family tragedy forever shapes and alters the boundaries of love. For a chance to win a phone-in to your bookgroup from Jane Hamilton, visit www.janehamiltonbooks.com for contest details. What aspects of youth are expressed in the novel’s title? Was it wrong, as Figgy believes, to give Madeline the trappings of a little girl? How did Figgy and Julia each define the ideal mother, the ideal wife, and the ideal life in general? How would you describe the narrator’s tone as he guides us through his unusual family history? How does Mac (Timothy) resolve the knowledge that Madeline’s accident made it possible for him to be born? Mac shares many nostalgic memories of his neighborhood, alongside wry observations about contemporary youth who spout pop psychology. How does Mac’s life as a husband and father compare to the family in which he was raised? What has been gained and lost in his family through these three generations? What accounts for Julia’s tireless patience with Madeline? Would Madeline have done the same for Julia if the circumstances had been reversed? What drew Timothy’s father to two such seemingly different women? We know from the beginning that the Macivers are wealthy (“We were all proud to have an estate . . . the fruit of our dead grandfather’s labor,” Mac says in the novel’s second paragraph). How does Mac feel about money? What does When Madeline Was Young illustrate about the concept of charity? What does Mac tell us, particularly during his tour of Russia’s world after her husband’s murder, about his opinions regarding poverty and race and class? Is his sister correct in viewing Russia as a slave? Was his mother unrealistic? What did he learn from the summer with Cleveland and his sister? Near the end of chapter six, Mac repeats lines from William Wordsworth while watching Madeline poolside. “She Dwelt Among the Untrodden Ways” ends with these lines: “She lived unknown, and few could know/When Lucy ceased to be;/But she is in her grave, and, oh/The difference to me!” Does this poem capture the essence of Madeline’s interactions with men, or is the poem an ironic choice? Should Mikey and Madeline have been allowed to marry? Which are the most and least genuine relationships described in the novel? The Civil Rights Movement and the war in Vietnam form the historical backdrop for much of the novel. What tone is set as Mac weaves Madeline’s story with his recollections of this turbulent time period? What was different about the undercurrent of war when the family gathered for the funeral of Buddy’s son, Kyle? Mac shares his father’s enthusiasm for natural history. How does Mac’s fascination with the natural world and anatomy shape his understanding of Madeline’s injuries? Is his approach to life clinical? How did your impressions of Buddy shift throughout the novel? Did Buddy “rescue” Madeline from Jerry in chapter ten? Why does Mac not see him as heroic, contrary to Russia’s point of view? 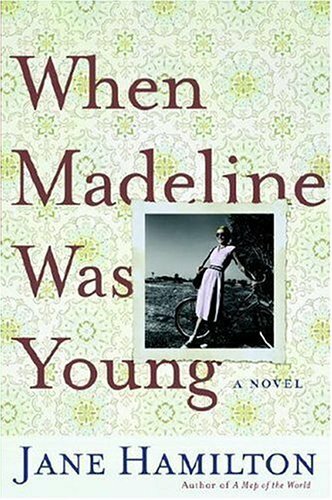 In chapter fifteen, why does Mac so badly want Madeline to remember the boy she encountered when she was in Italy years ago? What did Buddy and Mac resolve during their brawl in the novel’s final chapter? Jane Hamilton credits Elizabeth Spencer’s novella The Light in the Piazza for partially inspiring When Madeline Was Young. If you have read the novella, or seen its 1962 film version (starring Olivia de Havilland), or been in the audience for the award-winning musical, share your experience with the other members of your reading group. What might Madeline and Clara have thought of each other? What extreme differences exist between the matriarchs? In what way do the authors portray opposite forms of love?